Upper Falls. Beautiful, but not the only reason to visit! The 2nd largest state park in Michigan (#1 is Porcupine Mountains Wilderness State Park) boasts the 2nd largest waterfall in the U.S., east of the Mississippi. Tahquamenon Falls State Park receives 500,000 visitors a year due primarily to the two waterfalls that call the park home. Not to discount the park's other draws, the falls are far from the only reason to stop by. Undisturbed forest, some of it old growth, surrounds park explorers, and it is the tannic acid from the many hemlock and cedar trees that give the falls their unusual brown tones. Evidence of beaver activity presents itself in the gnawed-on trunks of many of these trees along the river. 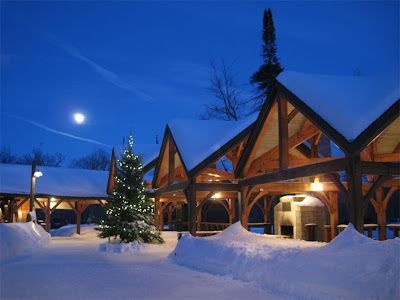 Year-round presentations and workshops educate visitors, such as a snowshoe making workshop, in which participants weave their own pair of traditional snowshoes. 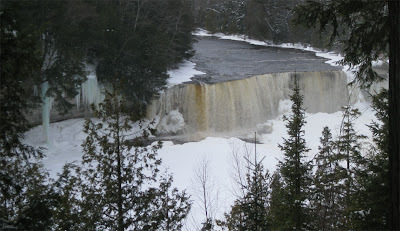 Winter is a spectacular time to visit Tahquamenon Falls State Park. 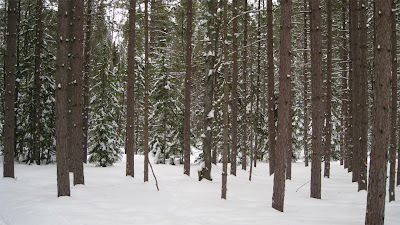 The droves of loud snowmobiles tend to wipe out any chance of seeing moose; however, the 40+ miles of hiking trails ensure plenty of opportunity for peaceful winter hiking. 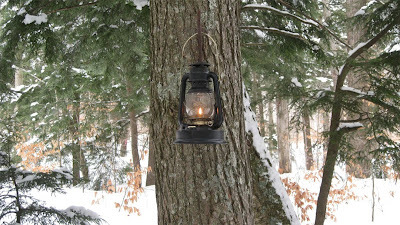 Many miles of cross-country ski trails are groomed, and some of these are lit with lanterns for night skiing. Backcountry campsites have recently been added to the state park and more are in development, providing year-round camping opportunities. The North Country Trail uses the scenic Tahquamenon River Trail as it winds through northern Michigan before eventually making its way south to the Lower Peninsula. For hikers with a lot of vacation time, the North Country Trail Association recommends a 102-mile stretch through the Upper Peninsula - beginning at Munising Falls in Pictured Rocks National Lakeshore and ending at Lower Falls in Tahquamenon Falls State Park - and considers it a premier segment of this 4600 mile multi-state hiking trail. A couple of weeks could not be better spent! Smokey should have worn a sweater. He looks nervous. With an average of 200 inches of annual snowfall, winter enthusiasts of all kinds are guaranteed not to be disappointed when traveling to this park. 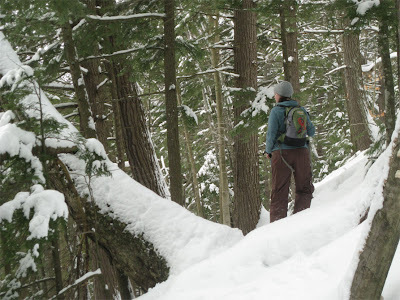 Snowshoeing is an ideal way to explore the area in winter, and on a recent trip to the winter wonderland that is the Tahquamenon River Trail, snowshoes were a must. 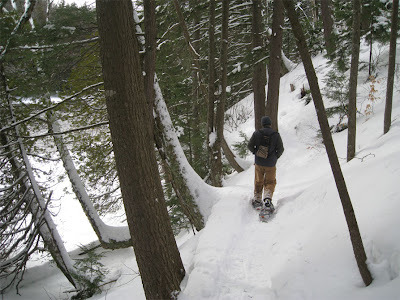 A 4-mile, one-way route between the Upper and Lower Falls, the TRT is possibly the most beautiful trail I've ever hiked in winter. Beginning at the Lower Falls, we were greeted by the roaring sound of the fast-moving river. 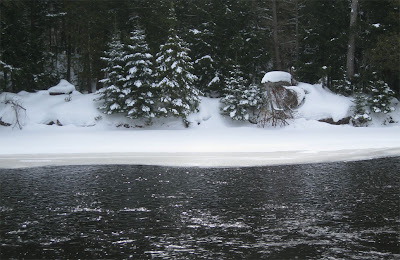 Mist filled the air above mounds of snow and ice, which had accumulated along the river bank and around the island that splits the river and causes a series of cascades. 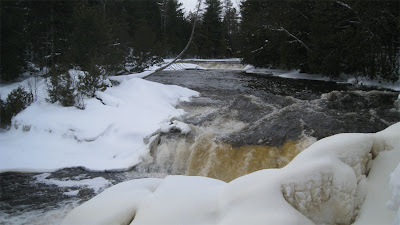 True to its name, the Tahquamenon River Trail briefly leaves the water to climb a ridge, but quickly returns to hug the river for the majority of the trip. 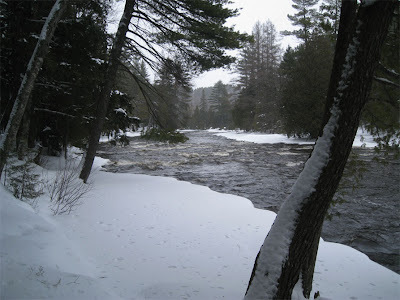 As we walked between the river and snow-blanketed forest, the only sounds we heard depended on the mood of the river – serene bubbling in calm areas, or loud roaring where the the current was more forceful. Light intermittent snowfall added to the beauty of the day, and reinforced my philosophy that most things are better with snow. The Upper Falls can be seen along the trail from the top of the canyon in which the river flows. A staircase then leads visitors to a viewing platform near the top of the waterfall for an up close view of the 200-feet wide by 50-feet high drop. 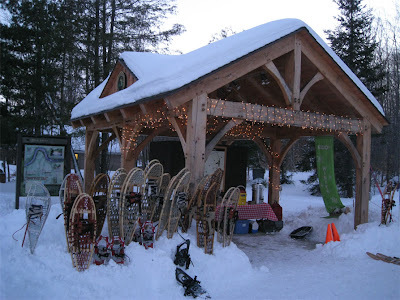 Near the Upper Falls parking lot, an interpretive gazebo provides park information, and is a hub of activity such as the guided snowshoe that was taking place on this particular weekend. Tahquamenon Falls Brewery and Pub is the perfect place to finish off the day with a bowl of wild rice soup, a whitefish sandwich and a pint of Porcupine Pale Ale by the fireplace. Press Play on the 2 videos below to see the Upper and Lower Falls in action! Gray wolf numbers are down at Isle Royale National Park as two of four packs disappeared over the past year. But scientists say the remaining wolves are in good shape. Biologists Rolf Peterson and John Vucetich of Michigan Tech University have released their annual report on wolves and moose at the Lake Superior park. Scientists have studied interactions between the two species there for 52 years. The report says there are 19 wolves, down from 24 in 2009. Two packs-the East Pack and the Paduka Pack-apparently have died out. The scientists observed only two packs and three "loner" wolves that weren't part of any pack. They also counted 510 moose, a slight dip from 530 last year but only half their long-term average population. thanks! p.s. LOVE your blog...great photos even better stories! Are you still taken? I have someone you might like in mind. B. Beautiful--I've been there a few times, but never in the winter--that would be a real treat. 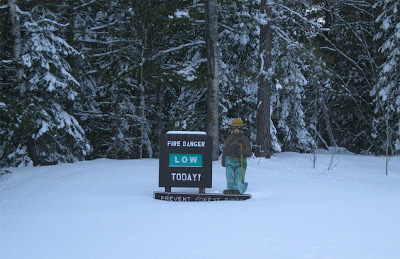 thanks for helping share info about our wonderful places up here in da UP, eh? the taq forests have really been hammered by the beech disease, but still worth the trip. do you paddle? Thanks for visiting. I paddle...badly. Well, I don't continually capsize or anything, but I need to work on technique. I don't paddle very often, but it's definitely something I want to do more of. I really like your blog just wanna thank you for sharing.